On Election Night 2016, the Brothers of Elvin E. Helms No. 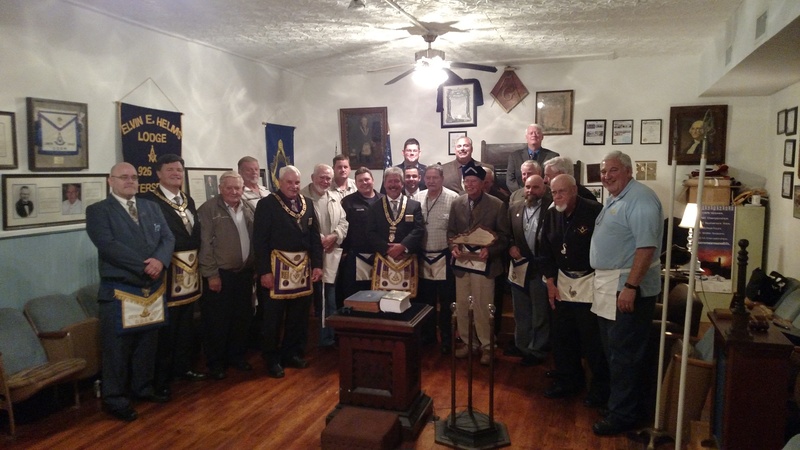 926 welcomed a capacity crowd for a great night of Masonry in Petersburg, Kentucky. 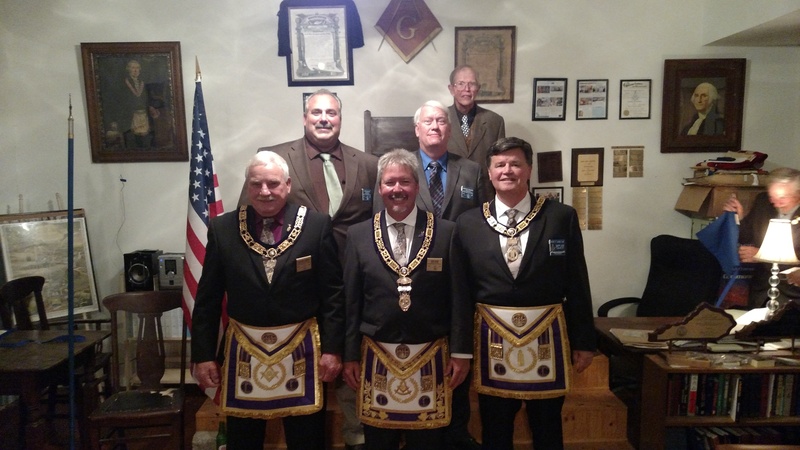 We were honored to have Most Worshipful Grand Master Todd Jones, Right Worshipful Grand Junior Warden Geary Laird, Worshipful Grand Senior Deacon Coleman Waford and Worshipful DDGM Kevin Schneider (District 18) in attendance. We had an excellent meal provided by Bro. Mike Boffemmyer, followed by the introduction of our distinguished visitors, an especially interesting education program for the evening, a new twist on our program with Kelley Elementary School, the Worshipful Master’s report from Grand Lodge, and last but not least, were able to share our Grand Master’s 2015-2016 Lodge of Excellence Award for the first time in Stated Communication. Pictured above, left to right: Jim Fletcher, DDGM 19; Geary Laird, Grand Junior Warden; Tom Roundtree; Larry York; Coleman Waford, Grand Senior Deacon; Chuck Yokum; Robby Ratliff; Jason Wallace; Most Worshipful Grand Master of Masons in Kentucky, Todd Jones; Sammy Meyerratken; Brad Drew; Buddy Wallace; Dave Cassesa; Worshipful Master Ernie Stratton; Ken Rogers; Jim Herzog; Travis Bush; Mel Kinser; Garry Kelly; Mark Rosen. Pictured above, left to right: Coleman Waford, Grand Senior Deacon, Grand Lodge of Kentucky; Dave Cassesa, Committee on Education, Grand Lodge of Kentucky; Most Worshipful Grand Master of Masons in Kentucky, Todd Jones; Ken Rogers, Committee on Masons Helping Masons, Grand Lodge of Kentucky; Worshipful Master Ernie Stratton; Right Worshipful Grand Junior Warden, Grand Lodge of Kentucky, Geary Laird. Our education program for the evening was presented by Worshipful Brother Marc Rosen of Poage Lodge No. 325. Brother Rosen is a former District Court and Circuit Court Judge in Boyd, County, Kentucky. His topic was the Grand Lodge of Kentucky Appeals Committee, on which he has served for many years, what is its purpose, and how it performs its functions. Especially interesting was the dialogue between Most Worshipful Grand Master Todd Jones and Worshipful Brother Rosen allowing for an explanation of the checks and balances between the judicial and executive branches of the Grand Lodge of Kentucky. As a result of the very unexpected conversational presentation and in following the Constitution of the Grand Lodge of Kentucky we do not have a transcript of the program to make available. 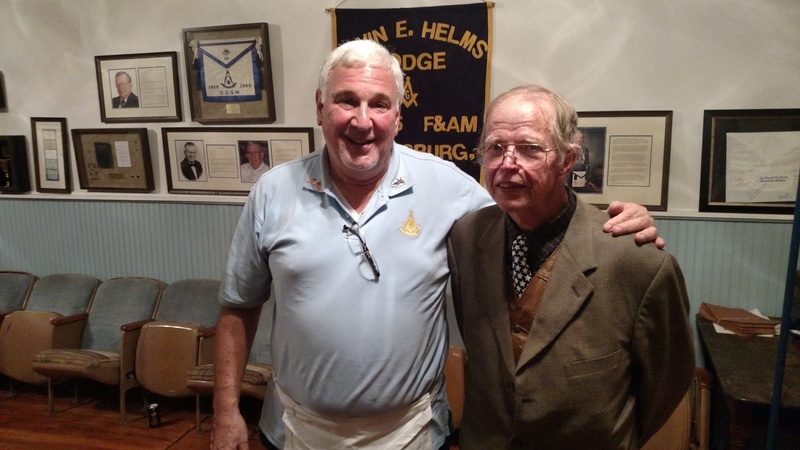 Pictured above, left to right: Marc Rosen; Worshipful Master Ernie Stratton. A Mason is a man who has decided he likes to feel good about himself and others. He cares about the future as well as the past. He does what he can both alone and with others to make sure the future is good for everyone. Recently I found that to be true. I belong to a small Lodge in District 19, DeMoss Lodge No. 220. Our Lodge was in need of some repairs, most importantly a new roof. To help offset the cost, we purchased a shotgun to be raffled. Tickets were printed up for a dollar donation. We did get our roof replaced and the shotgun raffle was a success because we made enough on the raffle to replace our gutters and downspouts, also. I would like to take this time to thank everyone that participated in the raffle. I would like to especially thank the man who sets the example of a true Mason. His name is District Deputy Dan Kemble of District 18. He was the winner of the raffle. Upon his name being drawn as the winner, he donated the shotgun back to the Lodge to be raffled again later in the year. Thanks again to everyone that made our raffle a huge success. 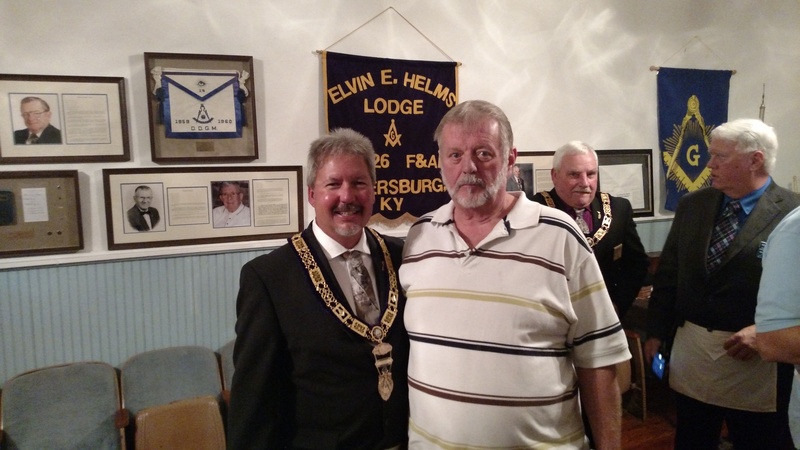 Pictured above, left to right: Most Worshipful Grand Master of Masons in Kentucky, Todd Jones; Larry York. An update on our program with Kelley Elementary School: a local church has come forward to help the school and has opted to take over our Christmas program, extending our reach and allowing us to redirect our own focus. As we all know, fine arts programs are the first programs to have their funds redirected or cut entirely. We now have the distinct honor of being able to redirect our support to the Kelley Elementary School Choir program and the school’s Family Resource Center. Thanks to the church for helping with the Christmas program, we are now able to support and maintain the Choir program which has been in danger, as well as support the Family Resource Center and Director Shelly Hoxmeier. 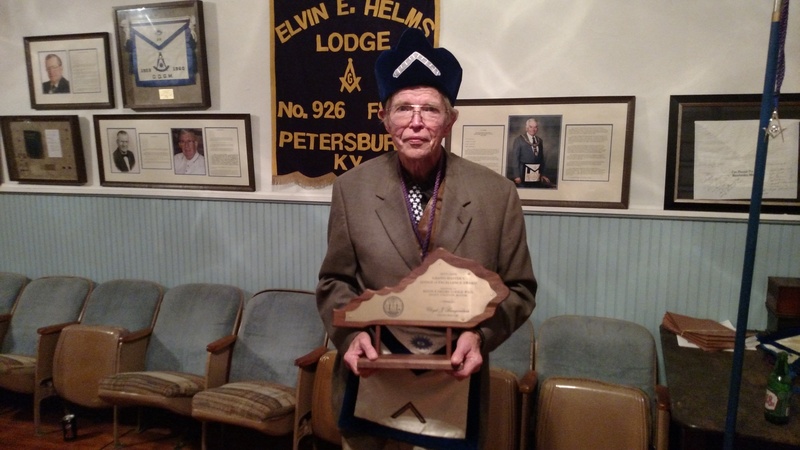 The Masons of Elvin E. Helms No. 926 have led by example and now others are joining in the efforts to aid and support our local elementary school. 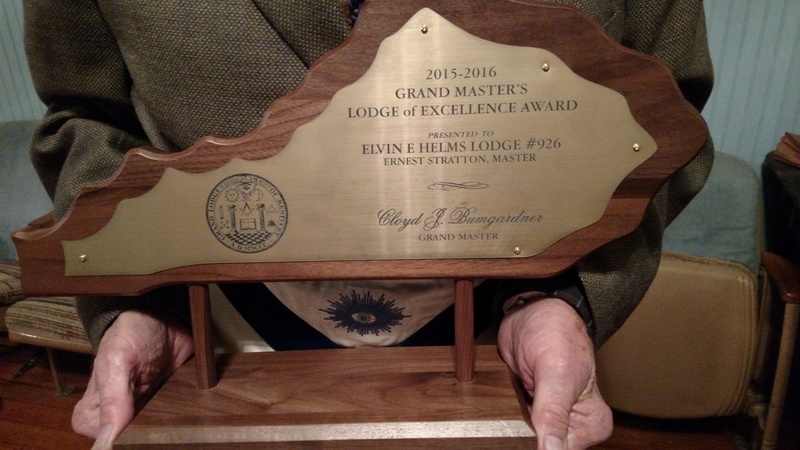 Pictured above, Worshipful Master Ernie Stratton poses with the 2015-2016 Grand Master’s Lodge of Excellence Award earned by Elvin E. Helms No. 926. After a long and fruitful evening, Elvin E. Helms No. 926 was closed in peace and harmony at 10:30pm. We thank all of our guests for making the trip to be with us this evening and hope you will return again soon!